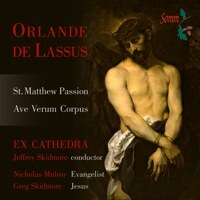 Lassus’ St. Matthew Passion and the beautiful 6-voice Motet, Ave Verum Corpus, which forms a perfect foil to the Passion. These are complemented by two other examples demonstrating Lassus’ amazing diversity as a composer: Vide homo, and Musica Dei donum (Music, gift of God most high). Both these were recorded by Ex Cathedra for ASV in 1996 and are included in this disc with permission from Ex Cathedra. They are among Lassus’ last published works. Vide homo is the concluding motet in the Lagrime di San Pietro, a cycle of 20 sacred madrigals. Musica Dei donum was originally planned as the final work in the final volume of Lassus’ six-voice collection Cantiones sacrae. Born in Belgium, Orlando di Lassus is today considered to be the chief representative of the mature polyphonic style of the Netherlands school and was the most famous and influential musician in Europe at the end of the 16th century. He was one of the most prolific and versatile of all composers of that period and in his time the best-known and most widely admired musician in Europe. He wrote over 2000 works in all Latin, French, Italian and German vocal genres known in his time. Among Lassus’ many sacred compositions (which also include 60 Masses and no less than 100 settings of the Magnificat) the Masses display enormous musical originality and agility. His settings of the four Passions are responsorial and typical of Italian composers throughout most of the 16th century. Lassus’ setting of the St. Matthew Passion, published in 1575, is responsorial and typical of Italian composers of the 16th century. Put simply, the words of Jesus and the Evangelist are chanted in Plainsong throughout, representing the narrative, and they are alternated by a 5-voice polyphonic group representing all the other characters. Lassus maintains a clear stylistic distinction between the two and this combination of long passages of plainsong with intense and detailed polyphony result in a work of focused and heightened emotion. The St. Matthew Passion enjoyed great and lasting popularity and a manuscript dated 1743 shows that it was still performed 150 years after its composition. Performing on this CD are: Grace Davidson, Elizabeth Drury, Sally Dunkley, Susannah Vango (soprano); Lucy Ballard, Mark Chambers (alto); Nicholas Mulroy, Christopher Watson (tenor); Greg Skidmore, Nick Perfect (bass).